As a brand experience agency, we choose to work with brands that we believe in, root for, and identify with. More often than not, these are businesses that realize their customer experience doesn’t fully deliver on their brand promises and are well-established enough to have a budget for outside design help. We’ve been waiting for a hidden gem that would allow us to create every aspect of a brand experience from the beginning. Luckily enough, we were presented with that opportunity when our former client, who just started a ground-breaking FinTech company, came to Cibo seeking a design partner. We set out to design every aspect of Income&’s brand experience, starting with their PowerPoint pitch deck that they used to secure an initial investment round. Revolutionizing investing as we know it, the four men behind Income& invented a new kind of fixed-income investment product, called a PRIMO, that offers high returns (greater than 6%) but with very low risk. While people in or nearing retirement need this kind of investment, it simply did not exist thanks to the financial crisis that’s affected our economy the last two decades. To add to the complexity, Income& wasn’t just offering a new market-disrupting investment. They also provided a marketplace platform to the lenders whose high-quality, prime-rated mortgages are used to create PRIMOs. Our first challenge was figuring out how to tell both of these stories in a compelling and straightforward way to prospective VC investors. So we developed a visual design system for the company and built a story into their pitch that would communicate this. Income& already had several meetings with prospective investors before we got our hands on their pitch deck. After we wrote the narrative and redesigned the slides, they immediately noticed a big difference in the reception they received—as in, money began rolling in. In between their investor pitches, we sat down with the founders to run our brand experience strategy workshops. Working together, we fleshed out their brand architecture, and imagined how their brand promise would surface in the key moments of their customers’ journey. We developed a messaging and positioning strategy and worked on the very first version of Income&’s web site and mobile app. Opinions vary, but most experts say that only about 0.5 to 0.7%. of start-ups successfully raise money from venture capital. Income& on the other hand went from an idea to securing venture capital funds in just six months. Two months after that, they were selected to be one of eight most innovative FinTech startups highlighted at South by Southwest Interactive. 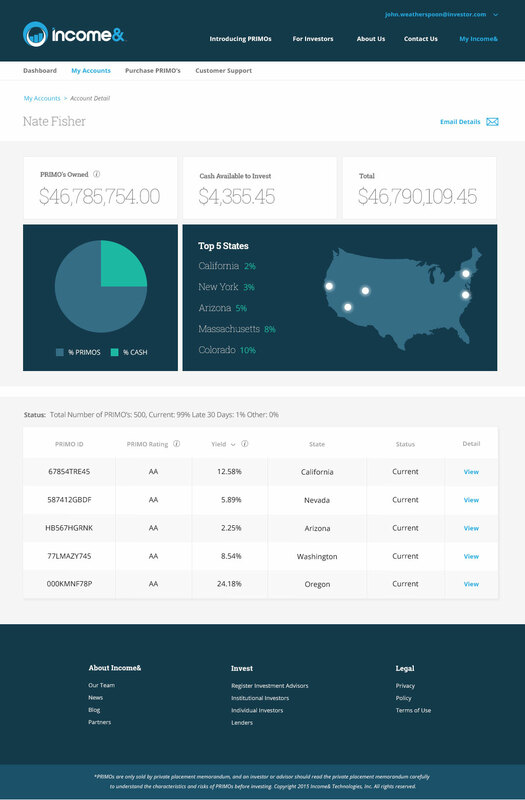 As they continued to pitch, we spent our time designing the full web site, and the application component of their product, which allows Registered Investment Advisors (and in the future, individual consumers) to buy PRIMOs and manage their accounts. We’ve also designed data sheets, presentations, icons, graphs, and more. In short, every customer–or investor-facing moment of the Income& brand experience has gone through a design process. The application of design thinking to building a business has resulted in a velocity that wouldn’t have existed organically. Having things designed from day one has eliminated many of the stumbling blocks between the best business ideas and successful execution, from simply looking professional to the more complex and crucial aspects of business, such as having a value proposition come across, or making a product appealing. This elimination of friction in building a company through design isn’t merely limited to how things look or the UX of the product. The largest impact we’ve had on Income& doesn’t have a physical manifestation in an interface or a product brochure. It exists on the cutting room floor of business design. Combining our expertise in brand experience with their rich knowledge in financial technology, we helped shape the overall business through recommendations and challenged assumptions. It’s amazing what solutions to business problems can be found when someone is willing to firmly insist that a given approach will negatively impact the customer’s experience. None of this could have happened without the type of collaboration that comes from compatible personalities and shared goals. Luckily, we found both in our relationship with Income&, and the results speak for themselves. PRIMOs launched in April 2016 and have seen phenomenal success to date. Author Bio: Alder is Cibo’s Chief Experience Officer. He spends his time thinking about the future of user experience, and making sure that we’re designing our way there, one click or swipe at a time. When he’s not working through the latest set of process flows, he’s spending time as one of the world’s leading bloggers about wine on his web site, Vinography.Com.